- White C6 as basecard. - Charcoal grey cardstock 10.5 x 14.5 cm. - Black funky foam 6.5 x 7.5cm. - Pink shimmer paper 6 x 7 cm. - Cover front of white basecard with charcoal greycardstock 10.5 x 14.5 cm. 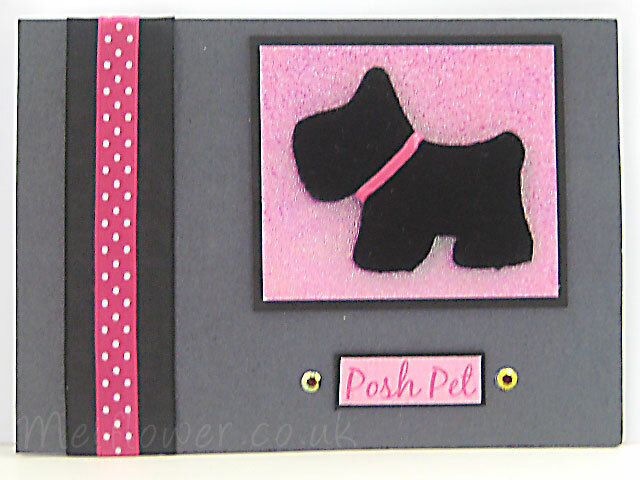 - Stick the pink shimmer paper onto the black funky foam. 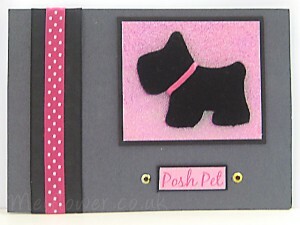 - Stick the posh pet words onto a small piece of black funky foam. - Stick polka dot ribbon on top of black organza ribbon. - Stick black gems on either side of posh pet. This entry was posted on Saturday, May 8th, 2010 at 1:51 pm	and is filed under Dog Cards. You can follow any responses to this entry through the RSS 2.0 feed. You can leave a response, or trackback from your own site.